We can all agree, having a sidewalk trip hazard is a dangerous (and potentially costly) liability. Property management groups, private homeowners, commercial property managers, and business owners all put themselves at risk if they choose to ignore the problem. So is grinding the best option for concrete trip hazard repair or is there a better way? Concrete grinding is one possible method for removing trip hazards. It’s less expensive than getting hit with a liability case and less disruptive than full concrete replacement. However, it isn’t the most effective form of concrete trip hazard repair. Here’s the difference between concrete grinding and cutting. A major advantage to concrete cutting over grinding is the cost-differential. Not only is concrete cutting more effective, but it also is considerably less expensive than its alternatives. On top of that, hiring a concrete trip hazard repair service that cuts away the problem eliminates the need to rent the equipment and handle it yourself. The other main disadvantage to concrete grinding is its limitations. Grinding does not effectively reach every angle of a trip hazard and in doing so leaves part of the liability. On top of that, it’s much more difficult to make the two surfaces a level slope with grinding. Cutting concrete can be done from virtually any angle and reach the full width of the panel without leaving unsightly rough surfaces. As previously stated, the limitations of performing concrete trip hazard repair with grinding can often result in leaving you with the exact same problem you’re trying to get rid of. Concrete cutting, on the other hand, guarantees OSHA compliant slopes. The repaired sidewalk panels are flush with each other and less slope less than 1/4″, which is the regulation as defined by the Americans With Disabilities Act (ADA). Another major advantage of cutting concrete is its ability to repair a concrete trip hazard in hard to reach places. For instance, if a trip hazard is in a corner or near a gutter, grinders would have major difficulties without causing damage to the wall or gutter. By contrast, cutting can be done in these places and leave a slip-resistant OSHA compliant slope without any risk of damage. Ready to schedule a concrete trip hazard repair service? 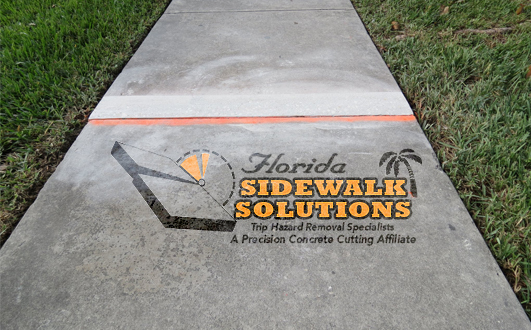 Florida Sidewalk Solutions is the premier trip hazard company serving South Florida. Contact us for a free estimate today and start scheduling your project soon!